17.3-inch all-rounder. 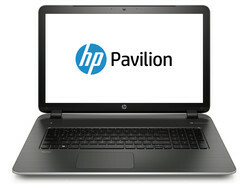 With its Pavilion 17, HP offers a gaming suitable 17.3-inch all-rounder priced at just under 600 Euros (~$660). However, we discovered some shortcomings. 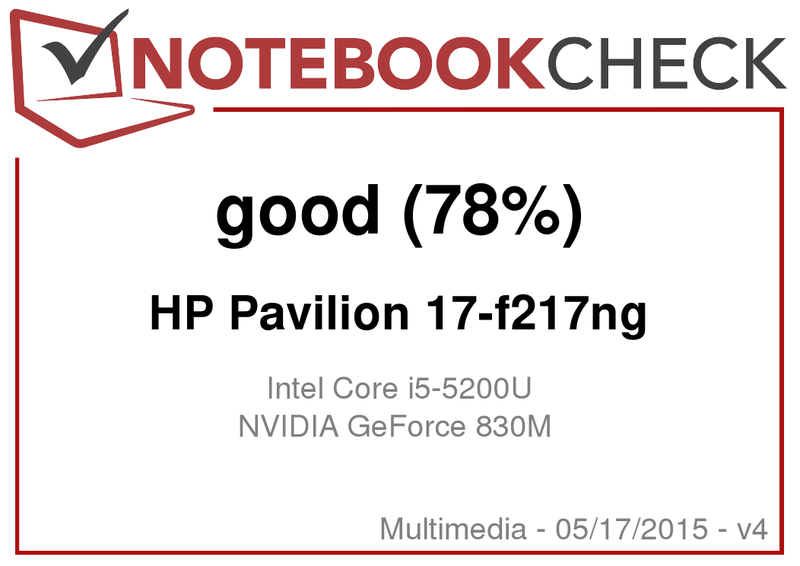 Having already tested two models from HP's latest Pavilion 17 series based on AMD innards, we are now facing a model equipped with an Intel CPU and Nvidia graphics core. Theoretically, the device should be stronger than its sister models. Our report reveals whether this is true or not. The Pavilion finds rivals among low-priced 17.3-inch all-rounders from other manufacturers. We would, for example, name Acer' Aspire E5-771G, Asus' F751 and Toshiba's Satellite Pro C70-B. Since the Pavilion 17 models we have already tested feature an identical build, we will not go into details about casing, connectivity, input devices or speakers. The corresponding information can be found in the review of the Pavilion 17-f050ng. Our review sample has been equipped with a 17.3-inch screen and a native resolution of 1600x900 pixels. Neither the brightness (227.4 cd/m²) nor the contrast (498:1) is exceptional, but they are still acceptable in view of the laptop's price range. The same is also true more for the contrast than the brightness. The latter could be slightly better even in this price range. The screen's color reproduction is not exactly awe-inspiring. It has a DeltaE 2000 deviation of 13.66 in the state of delivery. A rate less than 3 would be desirable. Beyond that, it has a distinct bluish cast. HP has installed a viewing angle dependent TN screen in the laptop. Consequently, the screen cannot be read from every position. Outdoor use is also barely possible, if at all. The glossy surface will usually prevent this. 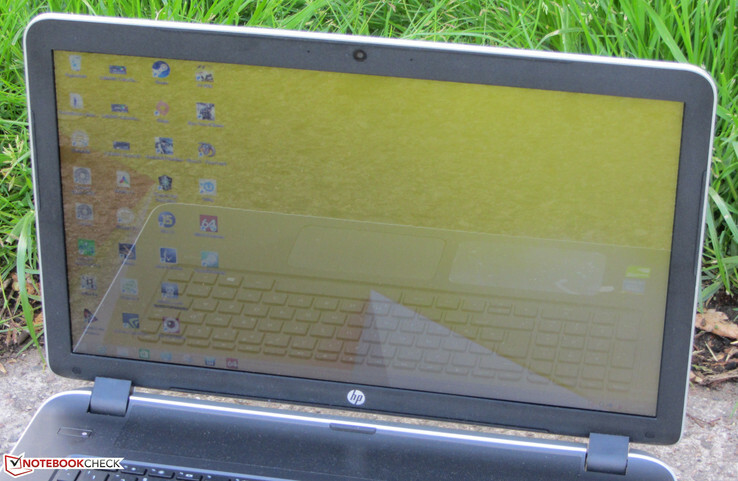 HP's Pavilion 17-f217ng is a 17.3-inch all-rounder. The installed hardware provides enough computing power for everyday use and can render games smoothly. Our review sample is currently sold at a starting price of 575 Euros (~$633). Other configurations are also available. There are models with both AMD APUs as well as Intel processor within the Pavilion 17 series. Our present review sample belongs to the second group. Intel's Core i5-5200U dual-core processor (Broadwell) is inside the laptop. It clocks at a base speed of 2.2 GHz, which can be boosted to 2.5 GHz (both cores) and 2.7 GHz (one core only) via Turbo. The Turbo is fully utilized in both AC and battery mode. The superiority of Intel's CPU compared to models with AMD's A10 chip becomes evident in the Cinebench comparison (single-core: +69%; multi-core: +46%). The former i5-4210U processor is outperformed by approximately 5 to 8%. The system runs smoothly; we did not experience any problems. The PCMark benchmark scores are also very good. Toshiba's Satellite Pro C70-B-111 achieves a considerably better score in the PCMark 8 Home benchmark because it is based on an AMD graphics core. The benchmark particularly benefits from AMD GPUs. The system performance can be increased by installing a solid-state drive. The system would then run much faster and Windows would start quicker. A 2.5-inch hard drive from HGST has been installed in the Pavilion 17. It has a capacity of 750 GB and spins at 5400 revolutions per minute. The drive's transfer rates are within the normal range for a 5400-rpm hard drive. The installed GeForce 830M graphics core is a rare guest. The Pavilion is the second GeForce 830M laptop that we have tested to date. The GPU is a member of the lower mid-range. It clocks at a base speed of 1028 MHz, which can be increased to 1150 MHz via Turbo. The core can fall back on a 2048 MB DDR memory (64-bit interface). The 3DMark scores confirm what the name suggests: Its performance is between a GeForce 820M and GeForce 840M cores. AMD's counterpart would be the Radeon R7 M260 graphics core. The scores of both GPUs are very close. The GeForce 830M graphics core is part of the graphics switching solution (Optimus) used in the Pavilion. The GeForce GPU is enabled in high-requirement applications, such as computer games. 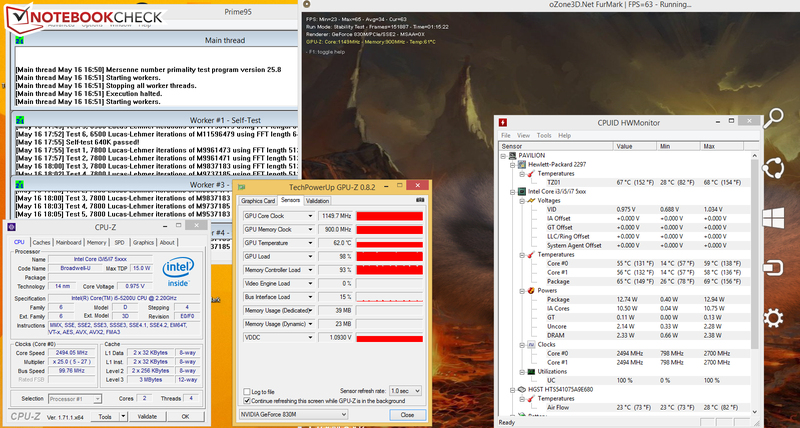 Otherwise, Intel's integrated HD Graphics 5500 is active. Switching is automatic, and the user does not have to do anything. However, it is always possible to intervene manually. 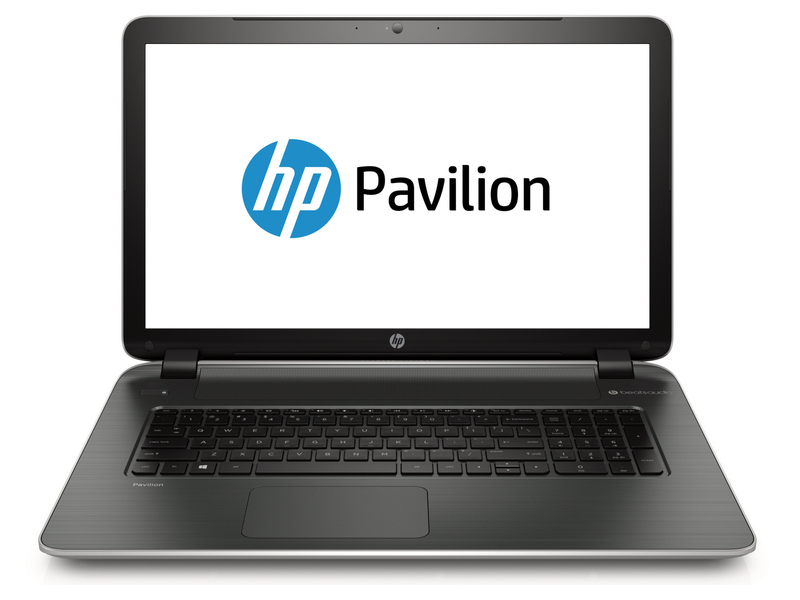 The Pavilion 17 is a member of the 17.3-inch all-rounders. Therefore, gaming suitability should be part of the repertoire of HP's laptop. Many games run smoothly in the HD resolution using medium to sometimes high quality settings. This is primarily true for games that have been available for some years or those with moderate hardware requirements. Newer games from 2014/2015 often require reducing the resolution and/or quality level. Acer's Aspire E5-771G would be an alternative to the Pavilion. Models with a comparable configuration based on Haswell or Broadwell processors are available for approximately 600 to 680 Euros (~$660 to ~$750). However, the installed GeForce 840M graphics core ensures slightly higher frame rates. Yet another HP laptop with a fan that runs permanently while idling. The reason is the same in the Pavilion: The feature "Fan always on" is enabled in the BIOS. The fan is sometimes inactive when this feature is unchecked. The fan speeds up strongly under load. We measured a maximum noise level of 45.2 dB(A). The fan in our review sample produced a subtle whistling noise during full load. However, its intensity is so low that it cannot be called annoying. The Pavilion processed our stress test (Prime95 and FurMark run for at least one hour) in the same manner in both AC and battery mode. The processor clocked at 2.5 GHz, and the graphics core operated at full speed (1150 MHz). Despite the high speeds, the laptop barely heated up. Even during the stress test, the temperatures remained below 35 degrees Celsius (~95 °F) at every measuring point. Thus, a more conservative fan management would still ensure sufficient cooling. (+) The average temperature for the upper side under maximal load is 30.4 °C / 87 F, compared to the average of 30.9 °C / 88 F for the devices in the class Multimedia. (+) The maximum temperature on the upper side is 32.8 °C / 91 F, compared to the average of 36.5 °C / 98 F, ranging from 21.1 to 71 °C for the class Multimedia. (+) The palmrests and touchpad are reaching skin temperature as a maximum (32.1 °C / 89.8 F) and are therefore not hot. (-) The average temperature of the palmrest area of similar devices was 29.1 °C / 84.4 F (-3 °C / -5.4 F). The Pavilion does not show any inconsistencies in power consumption. The energy requirement climbs up to 12.2 watts while idling - a normal rate for a 17.3-inch laptop of this performance category. It is a similar situation with rivals, such as Acer's Aspire E5-771G. HP's laptop consumes up to 44.6 watts during load. The Aspire needs more energy because it is equipped with a more powerful processor and a stronger GPU. Websites are opened automatically every 40 seconds in the real-life Wi-Fi test. The "Balanced" profile is enabled, and the screen's brightness is set to approximately 150 cd/m². The Pavilion achieved a runtime of 4:06 hours - a decent rate. The processor installed in the 17.3-inch Pavilion has more than enough power for routine use. It also renders computer games smoothly in conjunction with the GeForce graphics core. The laptop barely heats up and operates quietly at least in idle mode and after selecting the corresponding settings in the BIOS. The input devices are good enough for home use. Prolific writers should rather opt for another laptop. The measured rates of the viewing angle dependent HD+ screen will not excite anyone, but are still acceptable in view of the price. Unfortunately, HP has installed a model with a glossy surface here. For a price ranging from 575 and 600 Euros (~$633 and ~$660), the buyer gets a well-designed 17.3-inch all-rounder with HP's Pavilion 17-f217ng, which however also has its downsides. Shortcomings are, for example, the lack of a maintenance cover. It is not only the lack of a cover that has to be criticized, but also the build of the laptop. Although nowadays other manufacturers have also dispensed with a maintenance cover, the casing can usually be opened quite easily. This is not the case in the Pavilion - which is also the case for many other HP models. The one-year warranty is another point of criticism. Other manufacturers ship their similarly priced laptops with a two-year warranty. And finally: The Pavilion features only a Fast Ethernet. Gigabit Ethernet is standard today.